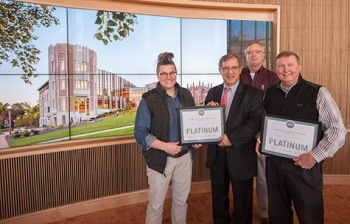 Hillman Hall, the Brown School's newest building on the Danforth Campus at Washington University in St. Louis, has received LEED (Leadership in Energy and Environmental Design) Platinum certification from U.S. Green Building Council. Hillman is the university's second LEED Platinum project, and the first on the Danforth Campus. It is also the first academic building to receive the distinction. The Lofts of Washington University, an $80 million residential and retail project, was awarded the platinum level in 2014. Green design is at the core of the Hillman Hall project. The building is approximately 105,000 square feet and projected to be 41 percent more efficient than a conventional building due to highly efficient heating and cooling systems, LED lighting occupancy sensors and more. The roof features a 66-kilowatt solar array, and a deck with planting beds. The site includes a large rain garden to capture stormwater and extensive native plantings, which will decrease the need for irrigation, reduce the urban heat island effect, create habitat and increase biodiversity. Hillman Hall, along with renovations to Brown and Goldfarb Halls, is an expansion of the Brown School's top-ranked social work, public health and social policy programs. The Clark-Fox Forum is a dynamic open space in the heart of the building. It's now used to host important events, discussions and conferences by on- and off-campus partners, further increasing the university’s connectivity with the St. Louis community. For more on the sustainability features of Hillman Hall, visit growleadchange.wustl.edu/Enhanced-Environment/Pages/sustainability.aspx. For a video, click here.